Dramatic exit last time out, better fortunes for France in Halmstad? Two years ago in Kuala Lumpur, Team France suffered a major shock at the 2016 World Team Championships losing out to the tournament's surprise package England in the last eight of the Men’s Championship Division. Now with the Liebherr 2018 World Team Table Tennis Championships set to arrive in Halmstad, Sweden from Sunday 29th April to Sunday 6th May the question will be whether or not France can produce a stronger showing on this occasion. Leading the line for the French team heading to Halmstad is Simon Gauzy, a player who enjoyed one of his best years in the sport in 2017. Bronze medallist at the 2017 Europe Top 16 Cup, Gauzy went on to reach his first ever Men’s Singles final on the ITTF World Tour and achieved a personal best finish of fourth at the Liebherr 2017 ITTF-Men’s World Cup. Then there’s 2016 European champion Emmanuel Lebesson, who also has what it takes to battle it out with the best while the remaining squad positions have been handed to Quentin Robinot, Can Akkuzu and Abdel-Kader Salifou. Last time out at the World Team Championships the French team made a positive early impression with a first position in Group B but exited to England at the quarter-finals stage of the competition. There have been some encouraging signs for France since that dramatic day in Kuala Lumpur including a third position finish at the Liebherr 2017 European Team Championships. Earlier this year in the English capital of London, Team France, without the injured Simon Gauzy, narrowly missed out on a semi-finals spot at the 2018 ITTF Team World Cup after suffering a tight 3-2 defeat at the hands of Korea Republic. Over 20 years have passed since France last won a medal at the World Team Championships but could that be about to change in the next few weeks? Can France cause an upset in Halmstad? 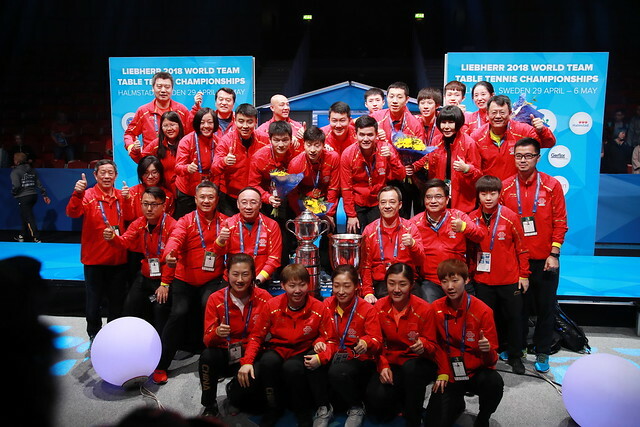 Find out in person by booking your tickets for the Liebherr 2018 World Team Table Tennis Championships here.